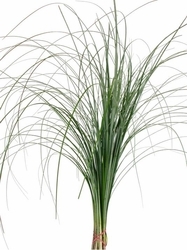 Bear Grass is a beautiful filler green with a thin-leaf stem that has a greyish-green color. The thinness of the stems give it a fountain like appearance when placed together. Each stem is between 18"-24" in length. Bear Grass can last 1-2 weeks, depending on care and climate. *This item is sold in a bunch with 40 stems.